An academic confronts privilege while his students discover art imitating life. I volunteered to teach a course at the Travis County Correctional Complex, a pretrial facility in Del Valle, Texas. 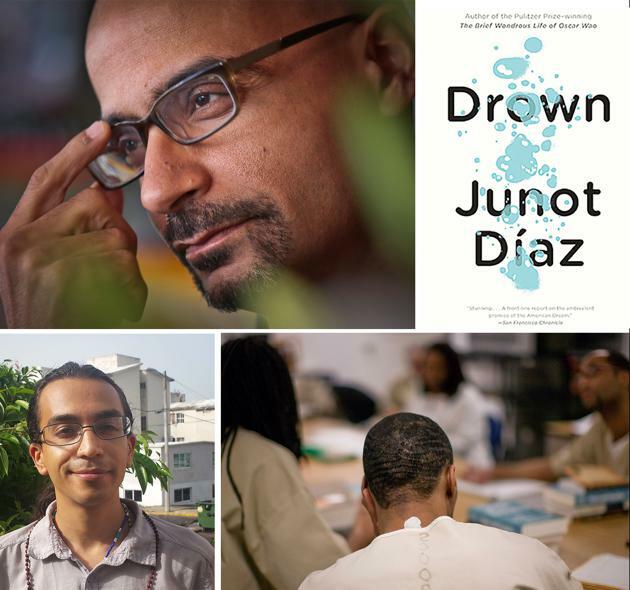 After a background check and an orientation, I was permitted to facilitate discussions on Junot Díaz’s first collection of stories, Drown. Volunteering at the jail for five weeks was a gesture of support for those caught in this country’s regime of mass incarceration. Having lived several of my adolescent years in a Section 8 housing project in Southern California, I saw early on how incarceration as a form of social control resulted in so many family members becoming exposed to the criminal-justice system. I selected Díaz’s Drown to explore the intersections of race, class, gender, and sexuality. As a collection of easily digestible short stories, I knew I could cover a few stories per class. More importantly, the narrator of most of the stories in the collection, Yunior, an inner-city Afro-Dominican immigrant youth living in the Dominican Republic and then New Jersey, is extremely relatable, particularly for this group of students. Being partially written in Spanglish, confronting issues of drug addiction, parental abandonment, and prejudicial attitudes regarding race and national identity, the text resonated on several registers for the students. Reading and discussing the work with my students led to a sustained dialogue on dealing with poverty. As students related Díaz’s short stories to their personal lives, the openness of one student would encourage another. One student analyzed the theme of illness in the short story “Fiesta 1980,” in which Yunior never fails to vomit while riding as a passenger in his dad’s car. Yunior’s parents suspect that his carsickness is from the smell of the upholstery. As a quick solution, Papi prohibits Yunior from eating before every car ride. This short-term fix avoids the underlying cause of the vomiting. The student argued that the illness was symptomatic of the toxicity of Yunior’s relationship with his parents. After reading “Aurora” in Drown, a student from California mentioned his experience caring for someone with a serious drug addiction, just as Yunior loved the character of Aurora. These early passages of Yunior’s childhood and adolescence in the New Jersey inner city set in motion several conversations on the role of masculinity, sexuality, and how we create unhealthy relationships that impact those around us. With my knowledge of Díaz’s opposition to the Dominican government’s anti-Haitian policies, I updated students on the 2014 legislation that resulted in precarious citizenship status for Dominicans of Haitian descent who have become stateless in mass-expulsion procedures, a.k.a. ethnic cleansing. By discussing Afro-Latinidad in Díaz’s texts, we examined the antiblack racism within Latino communities, on the one hand, and challenged the U.S. African-American English-language monopoly on blackness, on the other. This influenced students’ racial perceptions regarding blackness by addressing how Latino communities have historically distanced themselves from their blackness and interrogating how people of color internalize white-supremacist beauty standards that induce self-hate. When the subject turned to the island of Hispaniola, a student from Louisiana always asked about Haiti. Knowing that Louisiana had a strong Haitian connection, he was eager to learn more about Haiti’s history. After noting Mami’s offering of mentas to Eshu in “Fiesta 1980,” this student made several inquiries into Haitian Vodou. He told me: “There’s some brothers in my unit who practice that Vodou. ... I myself follow Christ and never really heard much good about Vodou ... but they told me about their faith, and it sounds good to me.” Together we examined how U.S. media has historically denigrated African-inspired religious traditions actively honored by diasporic communities across the globe. The racial differences of those imprisoned for nonviolent drug offenses was clear to me, having seen some relatives serving terms in juvenile hall and others spending years in prison. After learning about civil-rights-era political prisoners, teaching in a jail hit close to home. During my first week as a volunteer, a loved one was incarcerated. For these reasons, the prison is an emotionally and psychologically triggering environment for me. While seeing some of the conditions incarcerated people have to deal with every day, I became acquainted with institutionalized uniformity. The most common uniforms were: the police, the inmates, and the priests. In an effort to blend in, I wore a long-sleeved camisa de manta and blue jeans every time. Since I have no car to leave my backpack in, I would store it in a locker near the parking lot for 75 cents after arriving via the city bus or a ride. Afterwards, I’d pass through a metal detector to enter the main visitors' entrance, which was always empty. After receiving my ID badge at the front desk, my path to the classrooms was an outdoor walkway between tall chain-link fences equipped with barbed wire and video surveillance. Inside the building that houses the classrooms, an officer is stationed at a desk. I was given a two-way radio to remain in contact with the officer while with the students. The radio underlined my privilege over my students. The rules were simple: Any time a student wanted to leave the classroom, or if I was going to dismiss class, I had to radio the officer to ask permission. The officer would give me a "yes, go for it" or "no, stand by." This gatekeeper role granted me a level of authority I was not used to wielding. Michael Reyes Salas is pursuing a Ph.D. in comparative literature at the University of Texas at Austin, where he studies Caribbean literature. An earlier version of this article appeared in Pterodáctilo, a publication by graduate students of Spanish and Portuguese at UT Austin.